Sprinkle the surface of a cupcake mold with cooking spray or grease with butter to prevent the mini pies from sticking. Cut one roll of Pillsbury™ pie crust dough into 6 equal parts (you're going to use one piece for each pie). Take the pieces of dough and cover the bottom of each mold. Fill each mold with one slice of ham and one of cheese. Take the next roll of dough and cut into 6 more pieces that you will use to close each pie. Once the pies have been closed, use a knife to make 3 small cuts on the top of each pastry to allow each pie to cook evenly. Use a pastry brush to paint each pie with whipped egg. Bake at 375°F for 20-25 minutes, or until the pies have browned. Let cool a bit before serving. For best results, the dough should be at room temperature to allow them to unroll easily. You can serve these mini pies in pastry liners and place them in your child's lunchbox with their favorite fruit or drink. You can use smoked turkey if you don't want to use ham, or simply fill it with just cheese. These pies can be frozen and reheated in the microwave after they've been baked. Now that the kids are headed back to school, it's a good idea to have new packed lunch ideas ready for them. My grandson loves when I prepare something special for him, especially if there's cheese involved because it's his favorite ingredient. 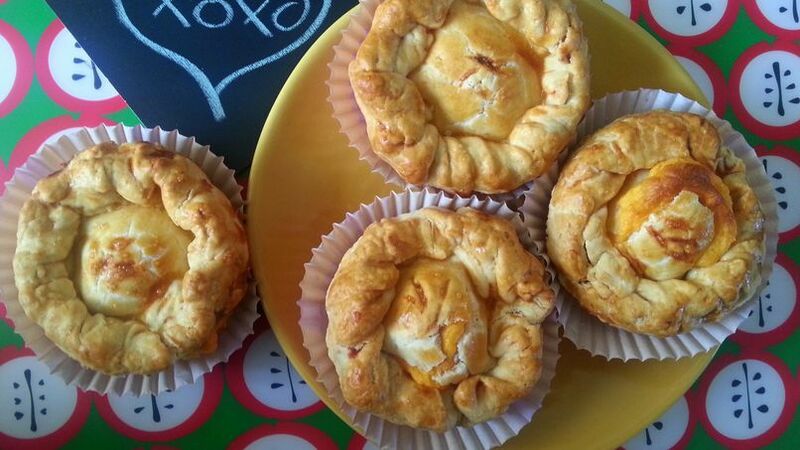 To change up his traditional sandwich, I decided to make these mini ham and cheese pies; they've been a hit! Enjoy!